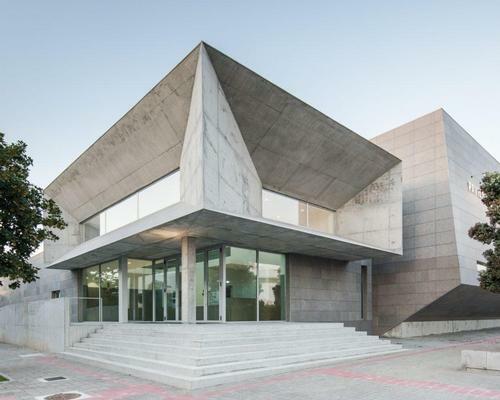 Portuguese architectural practice Valdemar Coutinho Arquitecos have created a dramatic new 7,000sq ft (650sq m) sports complex in the Viana do Castelo in northern Portugal, with a focus on greys, sharp edges and angles. The complex, called Atlantic Pavilion, with its brutalist-style facade, was commissioned by the local council. Entrance doorways are topped by a rectangular structure with two large recessed windows. These have deeply champfered frames, drawing the eye and creating more angular dimensions. Grey is used inside and out, with interiors matching much of the facade. The building has natural light on interior walkways and in the café. The architects say the grey palette “Alludes to the crustaceans on the beaches of Viana do Castelo and is reflective of the local coastline." Tiles throughout the building were designed by Mario Rocha. The complex functions mainly as a centre for basketball and volleyball.